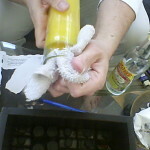 Candle Spell Candle Preparation Step By Step for Candleburning Success! Today, I am going to go over step-by-step the proper method of cleaning a candle for a candle spell. 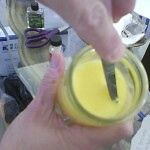 Recently, I was preparing a candle for a client and encountered a few items that I may not have covered in previous posts regarding candle preparation. 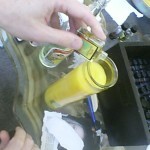 Here is the steps, with photos, to ensure candle spell success! First step is to clean the candle with Florida Water. You my also want to use Lemon Juice, or even a combination of using one first, such as the lemon juice (to ‘Cut and Clear’ out any negative vibes), then follow it with Florida Water (to bring in the ‘Good Spirits’). The traditional Florida Water known by most is made by Lanman and Kemp, but I picked this bottle up at our neighborhood ethnic foods store. It is made by Goya Products, which is a large manufacturer of products and foods for Caribbean cultures. 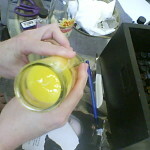 Make sure to clean both inside the candle (inner glass area, wax top and wick) and also the outside glass area. As I was cleaning, I found something embedded in the wax from the factory where they were produced. I took a small, sharp pointed knife and cut out the offending stuff. This would be a good time to trim the wick to two inches. Wipe down your candle again, you can NEVER be too clean. Another thought is this, you do not know if the owner of the Botanica or Candle Shop where you purchased these candle might be pre-blessing/anointing these candle to PURPOSELY not bring success to you, so that you will return over and over to purchase candles that have been ‘tuned’ to fail! There has been more than one unscrupulous shop owner out there in the world! 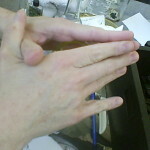 Now, it is time to anoint the candle with the appropriate condition oil. 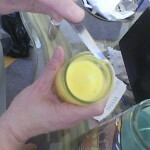 We are doing a “Road Opener” candle spell for our client, so the candle color matches the Road Opener Oil that we are using. You can see my table, with petition papers, photographs, my box of condition and anointing oils, various tools and shipping boxes to mail candles to clients who want to burn their candles themselves. 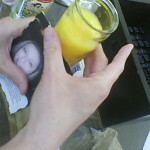 Now it is time to evenly distribute the oil over the top of the candle, pray over it and infuse it with intention and then attach the clients photo to the front of their candle. This candle will then go on my All Saints Altar, when I have candle going for clients 24 hours a day, 7 days a week! There you have it! 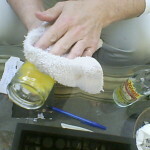 Step by Step instructions on how to properly clean, anoint, bless and create a candle for candle spell burning success!